An important part of the process of obtaining Social Security disability benefits involves determining your residual functional capacity. Simply put, determining residual functional capacity consists of an assessment of what work-related tasks a person is able to complete even though they have one or more impairments. These are activities such as sitting for periods of time, standing, walking, lifting items, carrying items, and pushing or pulling things. The assessment can also include mental activities, such as understanding and memory, the ability to interact socially, the ability to concentrate, and the ability to adapt. A form is filled out by a doctor that indicates the individual’s ability to perform work activities. This form is reviewed by Social Security Administration officials to determine your award of Social Security disability benefits. If you have a disability and you cannot work the way you once did, an attorney from Lawrence & Associates will review your case to determine how to help you complete the residual functional capacity form in a way that maximizes your ability to receive disability benefits. The dedicated attorneys at Lawrence & Associates have represented a large number of people in the Greater Cincinnati area. Over the years, our firm has obtained positive Social Security disability results for countless individuals. You may be wondering how you will obtain disability benefits and how you will pay an attorney to help you receive them, especially if your disability has you strapped for cash. You may also be wondering if you need a lawyer who specializes in obtaining Social Security disability benefits and completing the residual functional capacity form requirements. 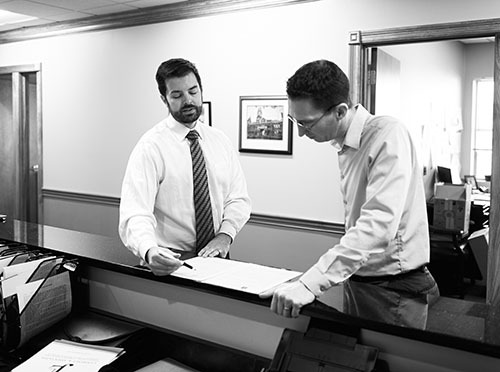 We can help you with the answers to your questions with a consultation with one of our experienced attorneys. The key point is that a Social Security disability attorney does not need to be paid up front for their services. In Social Security disability cases, federal law requires all attorneys’ fees be set at 25 percent of the total of the back pay Social Security award. This amount is capped at $6,000 and would include work on the residual functional capacity form that your attorney would complete as part of the case. The attorneys at Lawrence & Associates have handled numerous cases involving Social Security disability benefits. If you are looking for a lawyer in the Greater Cincinnati area, we stand out based on our experience and record of excellent service to our clients. We are known to be accessible and easy to reach. Clients appreciate that we take the time to explain the process and keep them informed about the details of their cases. It is no different when it comes to completing the residual functional capacity form to obtain Social Security disability benefits. Just as we’ve done for our previous clients, we will follow our tradition of pursuing a successful outcome on your behalf. In addition to the above, we’ve handled many unique situations for our Social Security disability clients with issues of residual functional capacity. Why is residual functional capacity important? You may think that having a diagnosis of a disability is enough to obtain Social Security disability benefits. However, the assessment of your residual functional capacity is highly significant because the Social Security Administration requires this assessment to be completed in addition to a diagnosis of a disability in many cases. Benefits cannot be awarded to you without this assessment, which measures your ability to perform work-related activities. Can I have more than one impairment? Yes. You may be assessed for more than one impairment, and the combination of your impairments may make you eligible to receive Social Security disability benefits. What does exertional level refer to? Exertional Level refers to the difficulty of a job in terms of the range of strength activities it requires. There are several levels, including sedentary, light, medium, heavy, and very heavy. While a sedentary exertional level would require only occasional lifting of a maximum of ten pounds at a time, a medium level of exertion could require lifting up to 50 pounds along with much more stooping and bending to complete that type of job. The exertional level you are assigned will be used to determine your eligibility for disability benefits. What does “markedly limited” mean? If you are “markedly limited” by a mental-health related impairment, it means that the Social Security Administration has determined that you are unable to perform even simple work that requires unskilled labor. It is important to know that if you are only moderately limited, you may be deemed to be able to do unskilled work even if you previously worked in a job requiring specific skills. What if my doctor does not believe I am suffering from a disability? It is critical that the doctor filling out the residual functional capacity form has a thorough understanding of your medical history and your disability. Any doctor is capable of assisting with the form. If necessary, try to see a specialist for your type of impairment who will listen to you, pay attention to details, and understand more completely the issues you are facing. The rates at which Social Security disability benefits applications are denied is startlingly high. Initial applications are denied about 65 percent of the time. In Ohio and Kentucky, if your case makes it to a hearing before an administrative law judge, you will have about a 45 to 47 percent chance of approval of your claim. Whatever the scenario, it is best to have a seasoned Cincinnati Social Security disability benefits attorney on your side. At Lawrence & Associates, we can help you through the process and keep you informed every step of the way, whether through an initial application, a request for reconsideration after a denial, or a hearing in front of an administrative law judge. If you are interested in seeking Social Security disability benefits, please contact Lawrence & Associates at (513) 351-5997 or reach out to us online to schedule a free case evaluation. Let us help you through the process of the residual functional capacity assessment so that you have the best chance of receiving Social Security disability benefits.